SOMETIMES I THINK THAT PHOTOGRAPHERS, especially beginners, needlessly hem themselves in by “pre-editing” their work. Being human, we all care, to some degree, about how our images “play” to various viewers, and so it’s understandable that we can be scared away from attempting certain things that are too jarring or disorienting to our intended audiences. We work to hard to avoid the attachment of certain labels to our pictures. The “a” word, “abstract”, is one such label. It’s a scare word. And it can spook us out of truly innovative image-making. Sure, we may know that, strictly speaking, abstraction really just means extraction, pulling a visual shorthand of essence out of a more complex subject. Rather than merely recording the full detail of an object in a photograph, the abstract photographer reduces it to its most effective basics. A baseball loses its stitches and writing and becomes just a sphere. Abstraction can also yank something out of its familiar context, forcing the viewer to regard it on its own merits, so that an entire salad is reduced to the sensual curvature of one section of a single vegetable. Okay, so that’s what we know about abstraction. However, what we feel, even about just the word, can cow us into conformity. We fear being called “artsy”, avant-grade, pretentious. And we gradually adjust our images to reflect what others regard as “real”. It’s tough: learning to trust your own vision is the single hardest lesson in any art. But what’s the alternative? Cranking out the same systematic execution of a flower for the next forty years just to curry favor with the mob? 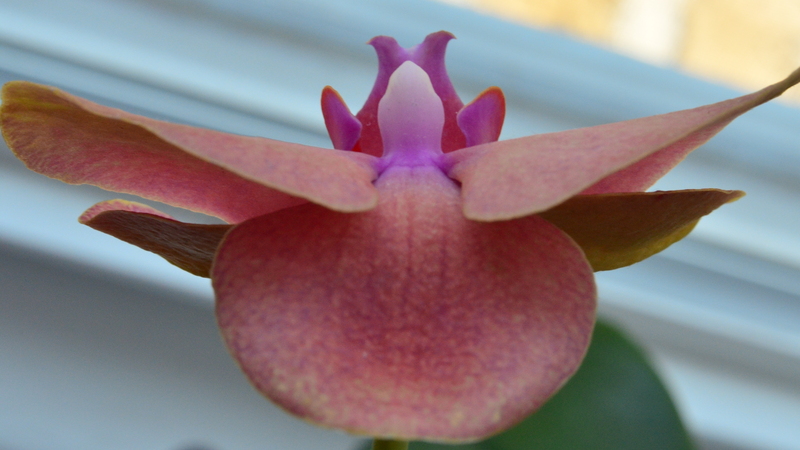 If you observe an orchid (like the one above), and see, not merely a flower, but a winged creature taking flight, why not take the extra step and reclaim the “realness” of that object for your own purpose? The camera is an interpretative tool, not a video recorder. Anytime we are tempted to restrict our pictures to what the world at large regards as “real”, we should listen for abstraction’s quiet but persistent question. “Real” according to whom? This entry was posted on August 12, 2017 by Michael Perkins. It was filed under Abstract, Conception, Interpretation and was tagged with Abstraction, analysis, VIsion. The only “reality” an object has in a photo is that which we confer on it! Thanks for your visit and the kind words. That’s my favorite part of this forum: that we inspire each other and compare our concepts in open conversation. I have learned so much just reading the reactions of TNE’s readers. Thank you and come back soon.